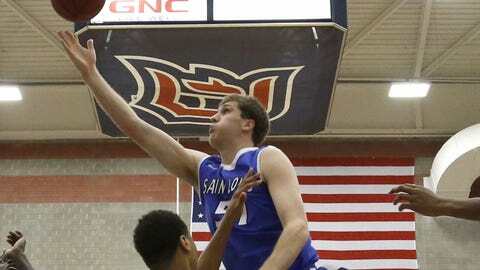 Rob Loe finished with 10 points, one of five Saint Louis players in double figures. PITTSBURGH — Saint Louis coach Jim Crews is one of only a select few in NCAA Division I that starts five seniors. The No. 19 Billikens needed all of their experience to avoid an upset against Duquesne. Mike McCall scored 13 points, including two free throws with 13 seconds remaining, as Saint Louis edged Duquesne 76-72 on Wednesday night. Reserve forward Grandy Glaze added 12 points and Rob Loe and Jordair Jett had 10 for the Billikens (18-2, 5-0 Atlantic 10), who won their 12th consecutive game. "Our seniors have been through it," Crews said. "They have good wisdom and poise about themselves. They move on to try to do the next right thing when we screw up or are behind. They’re pretty resilient that way." The biggest play actually came from a sophomore, Austin McBroom, who made a 3-pointer with 47 seconds remaining to give the Billikens a 73-72 lead they would not relinquish. Ovie Soko scored 18 points to lead Duquesne, which scored more points and shot a better percentage than any of Saint Louis’ previous 19 opponents. The Dukes (8-9, 1-5) went ahead 72-70 on two free throws by Jeremiah Jones with 57 seconds remaining, but Jett found McBroom alone on the wing after a drive to the basket was not open for him. McBroom was the second option on the play. FOX SPORTS MIDWEST: Read their bios, check out their upcoming appearances and view their photo galleries and videos. It was the second time in the final two minutes that Saint Louis had to erase a Duquesne lead. Jett made a jumper for a 70-69 lead with 1:50 left after Dukes guard Micah Mason put his team ahead with a 3-pointer on the previous possession. "They didn’t get rattled, not at all," Duquesne coach Jim Ferry said. "They kept playing. We got up eight. They kept playing. How many teams have been to the NCAA tournament twice and have five seniors?" The Dukes had a chance to take the lead with 13 seconds remaining, but Dominique McKoy missed a reverse layup. McCall rebounded and was fouled. He made two free throws at the other end to seal the win for the Billikens. Saint Louis continued its recent dominance over Duquesne, beating the Dukes for the fifth consecutive meeting and for the seventh time in eight games. This one was much tougher than the previous games, though. Saint Louis entered ranked sixth nationally in scoring defense and led the Atlantic 10 in field-goal percentage and 3-point defense, but the Dukes scored more points and shot a better percentage than any team had against the Billikens all season. The Dukes came out and scorched the Billikens early, shooting 52 percent from the field (13 for 25) and 56 percent (5 for 9) from 3-point range in the first half while taking a 36-34 lead into halftime. Micah Mason paced the Dukes with nine first-half points, all on 3-pointers. Mason, a transfer from Drake, was 5 for 7 from behind the arc. His final attempt with 4 seconds left on the clock could have tied the score, but it was off the mark. "We’re pretty good on defense and they made our defense look not too good," Crews said. "Tonight, they had our way with us most of the time." While Crews was dissatisfied with his team’s defensive performance, he was thrilled with his team’s offensive efficiency and poise down the stretch. The Billikens shot 50 percent from the field and made 10 of 19 from 3-point range, including 6 of their 7 attempts in the second half when they had to erase an eight-point deficit. "We’re very fortunate to come out on the top end of that," Crews said. "They’re so competitive and go right at you. They did a great job of getting spacing on us. Their two big kids had their way against us. But we were pretty good offensively throughout the night. We were still able to find a way to win. Different guys made big plays to win." McCall was 4 for 5 from the field and 3 for 4 from 3-point range. Jett dished out 11 assists to go along with his 10 points and Glaze fell two rebounds shy of a double-double. But it was McBroom, a sophomore guard, who made the biggest plays in the second half. He scored all 11 of his points after halftime, including three 3-pointers. "This season, we’ve been in circumstances where we had to fight," McBroom said. "We had to keep fighting and eventually it was going to fall into our hands."